Welcome to Cobble Mountain Lodge. See us on your way to Whiteface Mountain! 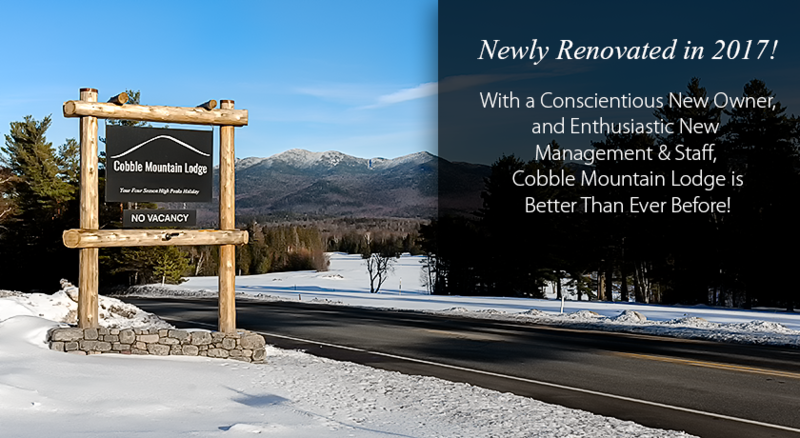 Nestled among the High Peaks of the Adirondack Mountains in the quintessential resort town of Lake Placid, Cobble Mountain Lodge is just emerging from a complete renovation and is ready to exceed your expectations. We offer many different sized cabins, from cozy spaces designed to accommodate two, up to large, multi-room cabins with kitchens designed to sleep 8. You'll be pleased to find authentic Adirondack style woodwork, fireplaces, air-conditioning, Simmons Beauty Rest mattresses, and more. In addition, we offer our cozy, authentic, motel-styled rooms, which can accommodate from 2 to 4 people, and are priced right to cradle you to sleep in the shadow of the Adirondack Mountains. Many improvements and continued renovations are planned for Spring 2017, including a brand new, on-site, secure building for gear storage such as bikes, skis and Ironman gear, and the addition of an outdoor pavilion with fireplace BBQ. We're the LAST hotel on the way out of town heading toward Whiteface Mountain, and directly across the road from the Lake Placid Club Golf Course. Rates, Deposits & Cancellation Policy Prices that are shown on our website, in our advertising and marketing literature, and on the LakePlacid.com website are in U.S. Dollars and do not include tax. All hotel room reservations will have a deposit of one night's stay plus tax charged at the time of booking. A 7-day cancellation policy applies to all reservations unless otherwise noted. We require guests who wish to cancel or shorten their stays to do so at least 7 days prior to their scheduled arrival. If guests cancel their reservations less than 7 days before their scheduled arrival, they will be charged for the first night and forfeit their deposit. Refunds are not available for early check out. A special 21 day cancellation policy and 4 night minimum is in effect for all Ironman and Half Ironman/70.3 bookings. Cleaning / Damage Fees We do charge a cleaning fee for all rooms and cabins; $15 for small rooms, $25 for small cabins and $35 for large cabins. Cleaning fees are itemized at final checkout here on LakePlacid.com. We ask that all dishes in cabins with kitchenettes be placed in the sink, and the cooking area and counter tops cleaned. (This cleaning fee also applies to guests that are staying with their dog, and is in addition to our $25.00 per stay fee for dogs.) Anything left that constitutes a "large and unreasonable mess" that requires additional and/or extreme cleaning may incur additional charges above and beyond the normal cleaning fee, up to the full amount of actual cleaning work required at the rate of $30/hour. Damage to your room or cabin will incur additional charges for the actual amount of damages. Pets Cobble Mountain Lodge, LLC. allows guests to bring their pets. The dog fee is $25 per dog, plus tax, per night. Dog owners who do not clean up after their dogs will be charged a pet cleaning fee (minimum $250). Housekeeping will not clean a room if a dog is present. If a guest who has brought a dog with them wishes to have their room cleaned, they should let the front desk know when the room will be empty. Dogs can not be left unattended at the lodge. Lake Placid is a very dog friendly town! Take your pet friend along with you to enjoy the day. All hotel room reservations will have a deposit of one night's stay plus tax charged at the time of booking, with full balance due on arrival.